The Big Catch is a great new slot machine with 5 reels and 20 paylines. Find your fortune under the sea among Anchors, Starfishes and a very entertaining bonus feature where you go fishing and can catch The Big Catch. The bonus feature is randomly activated and you can be sure it’ll be worth your while. The graphics and sound is amazing in this new slot machine from Astra Games. 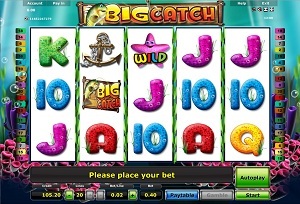 Graphics & Appearance: The Big Catch slot machine presents a colourful game window in a tropical underwater setting. The graphics are very detailed and the sound effects are very suitable. You will hear bubbles on every spin win and each pay line will get filled with water. The Big Catch slot machine is a fun and entertaining slot with a unique bonus feature. Gamble Feature: As soon as you have hit a spin win you will have the option to gamble your wins. This feature is activated by clicking on the Gamble button which is located in the bottom right corner of the game window. The feature will present a 50/50 chance for you to double your winnings or lose your spin win. If you manage to win, you will have to opportunity to gamble again. If you lose you are taken back to the reels. Game Symbols: The symbols used in the Big Catch slot is surprisingly not fish of any kind. The Anchor and the Big Catch symbol are the highest paying symbols. The Wild symbol is a Starfish and it will substitute for any symbol. The lower paying symbols are the 10, Jack, Queen, King and Ace symbols. There are fishes in the bonus feature but these will not appear on the reels. Bonus Feature: The bonus feature is activated at random at the end of a turn. In comparison to most bonus features in other slot games, the Big Catch feature is slightly more interactive in that sense that you have the option to choose which of the five reels the fishing hook will try to catch the fishes in. Once you click on a reel, the fishing hook will get lowered in to that reel and catch a fish that will award you with a prize such as Big Catch, Small Catch, and Very Big Catch. The bonus winnings are added to your game balance after the feature has been completed. Betting Options: The Big Catch slot machine has five reels and allows you to use twenty paylines. You can easily set your stake and payline preference by using the + and – buttons that you will find in the lower part of the game window. There is a paytable available where you can view the different payouts for each symbol. Game Features: You can choose to use the Autoplay function. You activate this function by clicking on the Autoplay button, above the Start button in the lower right part of the game window. When this function is activated, you will not be able to access the Gamble feature. You can stop the Autoplay function by clicking on the same button again. The Autoplay function will pause while the Bonus feature is played.